Photo: Start/Finish line: gantry removed, Pits Straight grandstands removed, work on new run-off for motorcycle racing. Work on the new Arena Grand Prix circuit and improved spectator viewing facilities is well underway at Silverstone. The Northamptonshire circuit has got off to a flying start in its efforts to complete dramatic updates to both the circuit and venue. 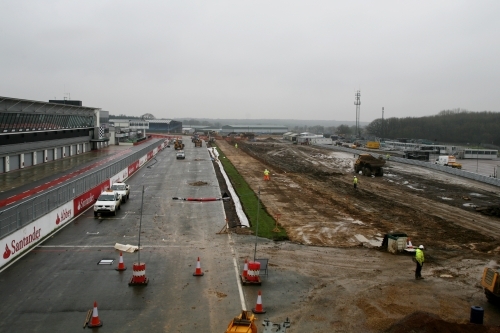 Richard Phillips, Managing Director of Silverstone Circuits Limited, has confirmed that work on the new circuit – which will host a number of world class events in 2010, including MotoGP and World Superbike motorcycle racing – is on schedule and due for completion in early March. He also confirmed that discussions are on-going with Formula One Management (FOM), regarding the possibility of hosting the 2010 FORMULA 1 SANTANDER BRITISH GRAND PRIX on the new circuit.